As I have said before, I have been cooking a vegan/vegetarian meal once a week.Â I really have enjoyed shaking up our dinner entrees. 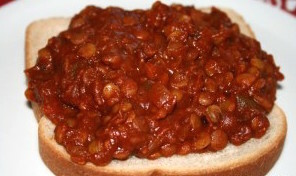 This week’s recipe is for Snobby Joes, which are the meatless version of Sloppy Joes. As I was reading the recipe, I noticed an ingredient that made me raise my eyebrows. Maple syrup. I was extremely unsure about adding it to my joes, however, I went along with the recipe and it tasted great –in fact I did not detect any mapley flavor.Â Next time I make these, I will “make them my own” by adapting the recipe for my flavor preferences, I found them to be a little too tomatoey, and I like tomatoes. In a small sauce pan over high heat, add the lentils and water. Cover and bring to boil. Once it is boiling lower the heat and simmer for 20 minutes. Once the lentils are soft, drain and set aside. 10 minutes before lentils are finished, preheat a medium-sized sauce pan over medium heat. Add oil and saute onion and pepper until soft. Add the garlic and saute for a minute (make sure not to burn your garlic!). Cook for about 10 minutes. Stir in the maple syrup and mustard, turn off the heat and let the flavors blend for about 10 minutes. Serve on buns or on bread open-faced style. ENJOY! Did you soak the lentils before cooking? These look really tasty!